Arrival of HE GG the late Sir Michael Ogio’s remains at AROB’s Buka airport. 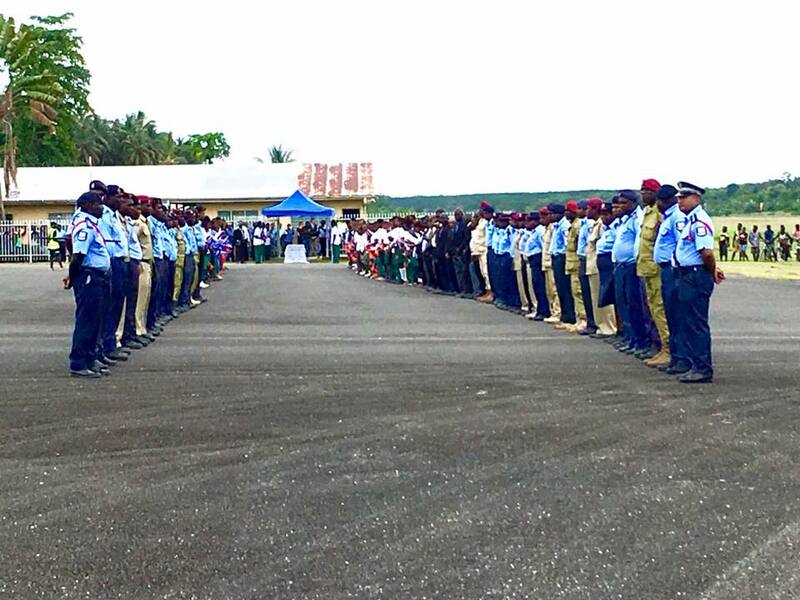 After the welcome ceremony at Buka airport HE GG the late Sir Michael Ogio’s casket was brought and laid in the Bougainville House of Representatives where the Vice President Hon Raymond Masono MHR led the tributes. 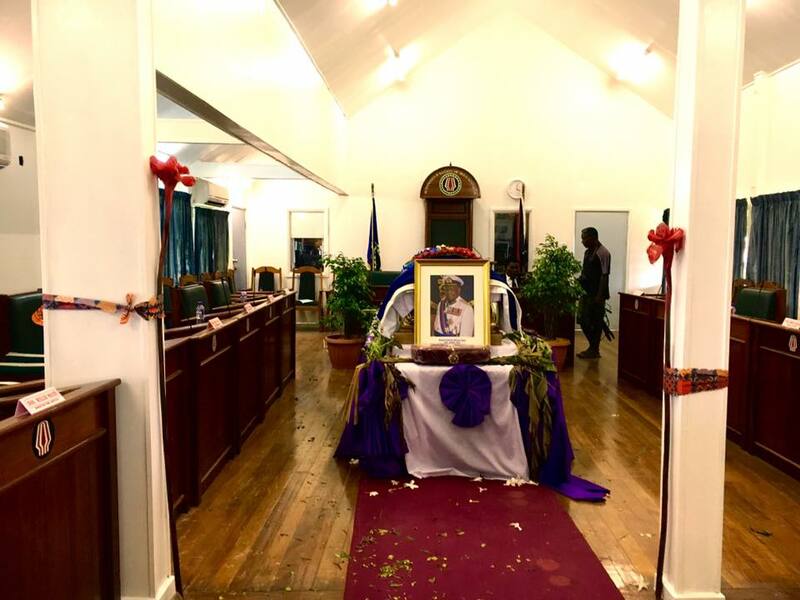 Several other members also paid their tributes including AROB MPs in the PNG National Parliament. We are gathered at this solemn service this morning to pay respect and tribute to an amazing man whose public service to his country and to his province and region, I can honestly say, was only surpassed by his humility, friendship and his moderating influence to achieve a fair outcome by everyone he came across in his lifetime. From the rural beginnings in his hamlet in the hills of Tinputz in North Bougainville this former teacher, schools inspector, provincial and national politician found his way up the ranks to become Governor General in a country that is diverse in language, culture, tradition and its people. The late Sir Michael Ogio was elected the ninth Governor General by the National Parliament in January 2011. At the time he was a serving member of the National Parliament representing North Bougainville open seat. In a proud line of elderly and mature, seasoned and experienced politicians that have represented Bougainville, Sir Michael will be remembered well by his constituents for his decision to vacate his seat and to be popularly elected by the National Parliament. He may have thought it better to continue serving his people as their member. However, he chose a higher calling and a higher national duty to serve the country. The election of Sir Michael as Governor General at the time is an occasion that made many Bougainville leaders and the people of Bougainville very happy. First of all he was the first Bougainvillean. He was one them. Secondly, because of his election there was a lot of renewed respect in Bougainville for the process of election of the Governor General by the National Parliament. The life story of Sir Michael Ogio is the story of a man who gave and who spent his life serving the people and the country he knew and loved. He never stopped serving until the very final days in office as Governor General. His story also represents a generation of people that gave meaning to public service, giving of themselves and their whole life to the service of the people. Sir Michael had a firm conviction and worked and lived true to the belief that there is no higher calling in terms of career than serving the public to make a difference in people’s lives. When we look back at the service of such men of Sir Michael’s generation they make it seem so clear that public service, especially in a developing country like ours, is a privilege. It is a privilege based on the moral foundations that we should value and espouse at all times. The Office of Governor General has served this country well. The Vice Regal Office served so far by men of such mettle, calibre and dignity of Sir Michael Ogio and the eight Governors General before him have served Papua New Guinea with honour and dignity. The Office has become an enduring and respected institution like an asterisk in the context of our democracy in this country. It has not been influenced or mauled by party political leniencies despite the fact that the Governor General is elected solely by the Parliament. Once the Parliament makes its choice the person that holds the office is not identified for whatever purpose with any party or any part or region of the country. Our constitutional fathers will be happy to acknowledge that the constitutional provision and protection of the Office is working well. There have been mainly two observations, often both criticisms and support from sectors of the public, which emerge from time to time in respect of the roles and responsibilities of the Governor General. We often hear how and why it is important that in the parliamentary democracy and system of government we have adopted it is important to have and guard the ceremonial roles and functions of the Head of State. The Head of State epitomises, personifies and symbolises the State its power and authority that we must treasure. This is why it is important if we have political milieus and spoils in the political governance of the country the Office of the Governor as Head of State must be zealously guarded and protected. To do this, the experience and wisdom of whoever is in office is called to the fore. I believe that Sir Michael Ogio and others before him when called to face up to the challenges have been able to call upon their experiences in public life, including in political life, combined with their wisdom and maturity as elders in our society, to be steadfast in upholding the Office. We also hear from time to time how some sectors of the public view that the Head of State be endowed with more power, even the power to hold the government of the day to account. This view is borne out of either ignorance or misunderstanding of the roles and functions of the Office of the Governor as head of state assigned and provisioned by the constitution. I make these remarks to illustrate the late Sir Michael Ogio has had to deal with these scenarios, as did his predecessors to varying degrees. In making these remarks I also pay tribute to Sir Michael Ogio in particular and to other Governors General in general for living up to the callings of the Office every time. It also supports that the election of the Governor General by the National Parliament is the most appropriate way how these wise and elder men are selected through the most exhaustive secret ballot. 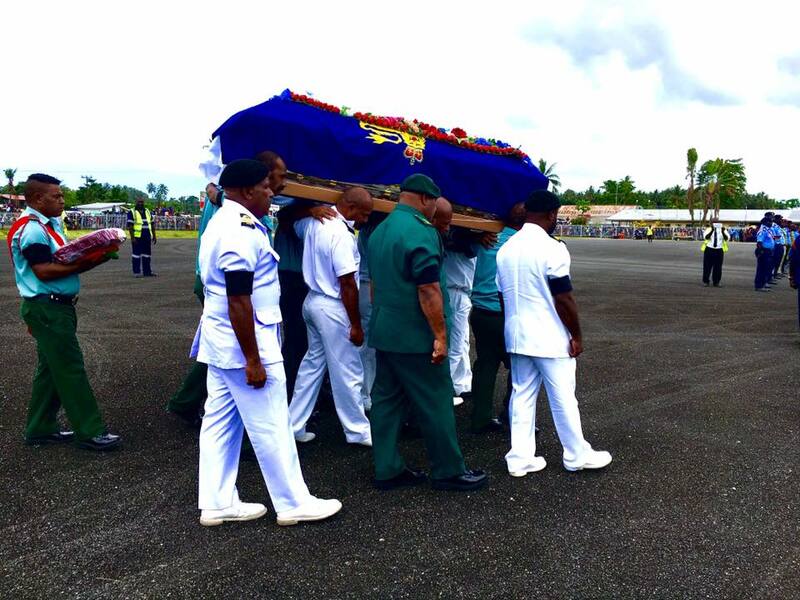 The people of Bougainville are saddened by the loss of Sir Michael. Sir Michael was many things to many people. He was held in high esteem as a community leader in his community in Tinputz. He was a peace maker, a moderate in the midst of inflexible, hard line voices. He always wanted to balance things out so that the outcome for all parties is a win-win situation. He was a friend to everybody, a jovial one who liked to listen to everyone that had something important to say. Sir Michael didn’t buckle under pressure, whether it is the normal pressures at work or at home or the worst life threatening pressures that he had to deal with in some of the darkest hours in Bougainville when he was serving his people in Parliament. He always acted the part of a Bougainvillean that spoke to people saying that Bougainvilleans are very reasonable people. He believed that even in the worst of times when all seems lost there are voices of reason we must muster and listen to ourselves. And that in the rough and tumble of politics there is always a time to be humble, to show humility and to be reasonable human beings. In the annals of Bougainville’s recent history, Sir Michael’s name will always be etched with and alongside other political leaders of Bougainville as a peace maker, a peace broker, a stabiliser, the one leader who always displayed conciliatory traits and tendencies. He had a moderating influence during the peace negotiations and peace process where these took place among the different factions in Bougainville and offshore and in meetings with the National Government. Sir Michael followed through his belief and convictions with other leaders that the only way to peace is a negotiated settlement. That in choosing leaders to carry through with the Bougainville Peace Process a choice through the ballot was preferable to the bullet. That reconciliation was far and away better than confrontation. Bougainville still elects four members to the National Parliament. It is because of both the participation and intervention of collective leadership which has included a very important contribution of leaders like Sir Michael Ogio that Bougainville still maintains its representation in the PNG National Parliament. The people who will miss Sir Michael Ogio most are of course his close family and relatives. The other people that are still mourning his passing away and will also miss him are the people from the electorate of North Bougainville. They have continually stood by him because they have continued to return him as their Member in Parliament up to the time when he was appointed Governor General. I am at this funeral service with a delegation of three Members of the Bougainville House of Representatives. The delegation and representation I lead includes the Minister for Education the Hon Thomas Pataaku and two senior parliamentarians, Hon Ezekiel Massat who is chairman of PAC and Hon Joseph Watawi, chairman of our parliamentary committee on referendum. May I finally express on behalf of the President, Hon Dr John Momis and the Bougainville Executive Council, on behalf of all Members of the Bougainville Parliament and on behalf of the Bougainville people our deepest gratitude and appreciation to the National Parliament, to the Prime Minister and the National Government and to the rest of the people in this country for the honour and privilege in bestowing the honour to a Bougainvillean, Sir Michael Ogio to hold and serve in the highest Office in the land as Governor General. We know he has lived up to his pledges in office and has not let anyone down. He has served his term right to the final days. 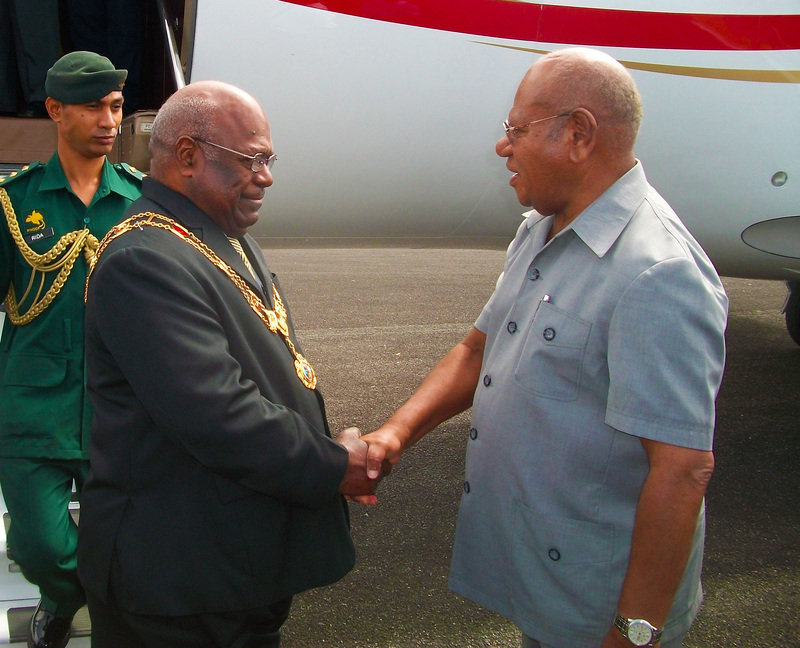 The President and the People of Bougainville will receive the late Governor General Sir Michael Ogio in Buka today (26 Feb ) and many people will accompany him to his community and village in Tinputz where will be finally laid to rest on Sunday afternoon. We offer and extend our sincerest condolences to Lady Esmie and the family. Mr Masono was sworn in as Vice President by Chief Magistrate Bruce Tasikul after being appointed by ABG President Chief Dr John Momis. 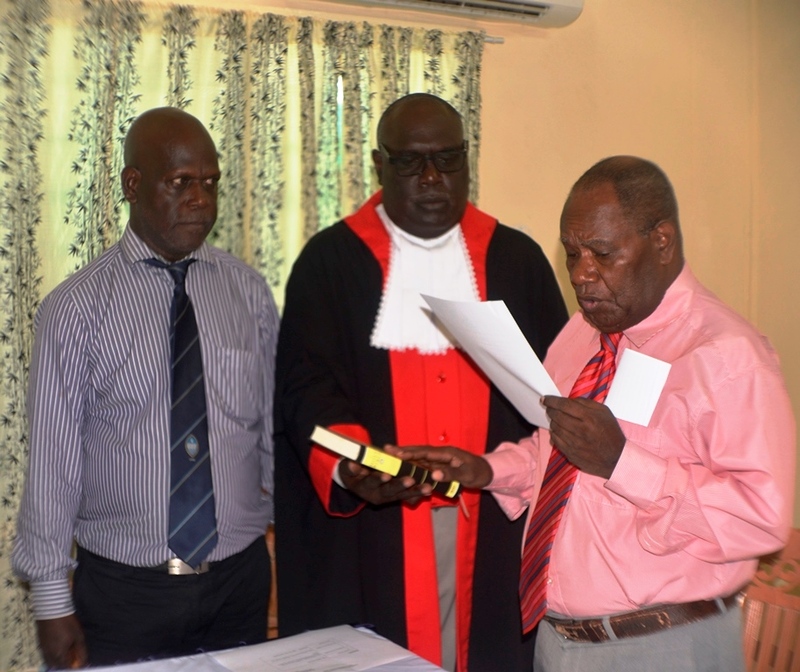 Pic 2 Caption: New ABG Vice President Masono sworn in by Chief Magistrate Bruce Tasikul while Cheif Secretary to ABG Joseph Nobetau looks on. The decision to appoint Masono came after the incumbent, Nisira had made his decision to resign the VP’s post and contest the 2017 National General Election. Mr Masono is from the Carteret’s Island and is a first term MP in the ABG and the Member for the Atolls Constituency and Minister for Public Service. Prior to his entry into politics Masono had a distinguished career in the Bougainville Public Service and held several senior positions; including Acting Chief Administrator, Deputy Chief Administrator Policy and Director for Panguna Negotiations. “I want to express my sincere gratitude on behalf of the Atolls people for the President’s confidence in appointing me as his new Vice President,” Masono said. “I accept this appointment with great humility, for me personally it is a great honour to serve as the Vice President of one of the founding fathers of this nation and I want to assure the President and the people of Bougainville of my undivided loyalty and continued support to the President and ABG,” Masono said. “I undertake to do my very best to support the President and the government to ensure that ABG’s key objectives on economic recovery, infrastructure development and law and order are realised with limited available resources,” he added. Masono also paid tribute to his predecessor for his immense contribution to the ABG since he first became a member in 2005 and eventually Vice President in 2010. Masono wished Nisira well on his aspirations in the National Elections and congratulated him on taking the Bougainville issue to the next level which is the National Parliament of PNG. Apart from Masono assuming the responsibilities of the Vice President he also retained his ministry as Minister for Public Service. President Momis also announced a reshuffle in his cabinet, the ABG Finance Minister Albert Punghau has now been appointed the Minister for Implementation of Bougainville Peace Agreement formerly Ministry of Referendum, Peace and Veterans Affairs that was held by the outgoing Vice President, Patrick Nisira. 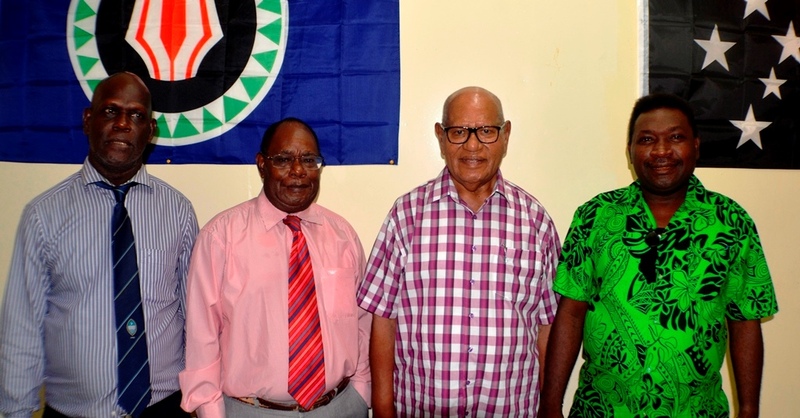 For the time being President Momis has assumed the role of Minister for Finance and Treasury until such time as he announces a full cabinet reshuffle. Outgoing ABG Vice President Patrick Nisira has been described as a creative thinker and pragmatic leader who did a lot for his constituents and the people of Bougainville. ABG President Chief Dr John Momis made these remarks during the swearing in ceremony of the new Vice President Raymond Masono. Nisira was first appointed as Vice President in the first Momis administration in 2010 and then again in 2015 during the last ABG elections. “For a young man he showed maturity and great concern for his people and he was a very good member of the Bougainville Executive Council,” President Momis said. “He was not a populist leader but he led by example and made his decisions in government as a matter of principle,” Momis said. “I must say forthwith that I did not make a mistake when I first appointed Mr Nisira as my Vice President, his contributions to the ABG especially his commitment to the executive government and to the formulation of new laws and policies such as the ABG Mining Act where he was a strong advocate for landowner rights and of recent as Minister for Referendum,” Momis said. “The next journey that Mr Nisira embarks on is not one that will abandon us, no he is strategically repositioning himself to further the Bougainville agenda and ensure that the dreams of the people of Bougainville are realised,” he said. “Our vision is to create a new nation whether an independent nation or a nation within a nation and create policies on economic development, infrastructure development and qualitative change for our people,” Momis reminded Mr Nisira. Mr Nisira also thanked President Momis for having the confidence in him and appointing him as Vice President in both his administrations. “It has been a privilege for me as a young man to have served under one of Bougainville’s and PNG’s greatest leaders and I consider President Momis to be my political mentor,” Nisira said. Nisira also urged the ABG Ministers and Members not to lose focus on the journey that Bougainville is heading towards and that is achieving a definitive political solution to Bougainville’s future. “Please continue to continue to concentrate to on the aim of the ABG which is to empower Bougainvilleans to manage their own affairs, solve their own problems and work hard to realise our people’s aspirations,” he said. Nisira will remain as the Member of the Halia Constituency until he formally resigns from the Bougainville House of Representatives. ” It is with a heavy heart that leaders and people of Bougainville, especially those of us who knew him, received the news of the passing away of the former Governor General Sir Michael Ogio. He was strong, committed and stoic public figure whose contribution to Bougainville and the country is well known and widely acknowledged. See Below 2 The Prime Minster, Peter O’Neill, has released the following statement in the passing of H.E. 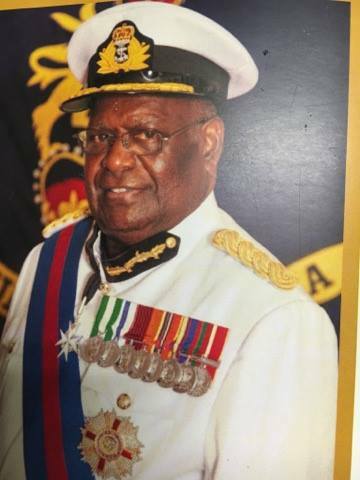 Sir Michael Ogio, GCMG CBE. Sir Michael Ogio’s life is a story of selfless public service deserving of praise by all Bougainvilleans and the rest of the country. The PNG National Parliament chose him to be the Head of State, a Vice Regal, representing Her Majesty the Queens in PNG. He was good, suitably qualified choice. His own clan chieftain status in his society in Bougainville, his personal humility and his immense knowledge and understanding of the country, the nation and the people made him a good choice as Governor General. The Bougainville House of Representatives and its Members express and extend our sincere condolences to Lady Esmie Ogio for her loss at this difficult time especially so soon after the end of Sir Michael’s term as Governor general. The ABG joins his family, his people and the whole country in remembering and celebrating Sir Michel’s lifetime. 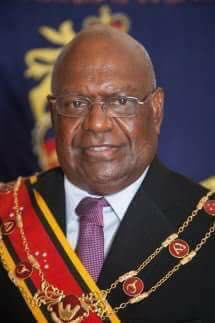 It is with the greatest of sadness that I mourn with the rest of Bougainville the passing of one of this nation’s finest statesmen in the Late Governor General His Excellency Sir Michael Ogio. The Late Sir Michael Ogio served this nation and the people of Bougainville with commitment and great distinction. His long career began first as an educator, a politician and peacemaker and finally holding the highest office in the land as the Viceregal. Sir Michael Ogio was a staunch Catholic and family man; he was a man amongst men, a leader with the heart for his people and his selflessness and Christian values were the hallmark of his jovial attitude to life to which he lived a full one. As a teacher His Excellency had taught in many schools throughout the country prior to PNG gaining independence. His love of teaching was very well reflected in his demeanour and the manner in which he carried himself. Sir Michael Ogio was then elected into the then North Solomons Provincial Government and served as its first Minister for Education and from there he contested the National Elections and was elected into office as the Member for North Bougainville. As a National MP he held various government Ministries and further distinguished himself as a leader at the national and international level. It is worthy to note his time as Member for North Bougainville which was through the darkest years of Bougainville’s history during the Bougainville Crisis (1989-1997). The immense contribution that he made in the peace process and the peace building after the Crisis during this tumultuous period must be lauded as he was one of the foremost leaders who led our people into the peace that we enjoy today; that is by far Sir Michael’s greatest legacy, to finally see Bougainville at peace and the people’s drive to self-determination to be enduring as ever. I pay tribute to this great man who was a friend and contemporary of mine and on behalf of the Autonomous Bougainville Government and the people of Bougainville I offer my sincerest condolences to Lady Esime and the family of our Late Governor General Sir Michael Ogio. Let us not be bereaved by grief but also celebrate the life of this extraordinary man who for more than 40 years dedicated his life to serving this country through the public service and through public office as a politician and statesman. May God our Father grant him eternal rest. The Prime Minster, Peter O’Neill, has released the following statement in the passing of H.E. Sir Michael Ogio, GCMG CBE. “It is with great sadness that I have been informed of the passing of the Governor General of Papua New Guinea, the Late Sir Michael Ogio. The people of the Autonomous Region of Bougainville have a dream to create a new socio-economic political and moral order as they stand on the threshold of the Referendum. ABG President Grand Chief Dr John Momis said that dream is within the reach of the people of Bougainville but they first have the responsibility to implement the Bougainville Peace Agreement. NOTE : ABG President Grand Chief Dr John Momis has thanked the people of Bougainville and Papua New Guinea who had him in their prayers during his time in the hospital in the Philippines. The President’s doctors have given him a clean bill of health and he said he was ready to get back to working with the people as they prepare for the upcoming referendum. Picture is the President with journalists during his first press conference on last Friday after his return the previous day. President Momis said the problem the ABG faces was a lack of technical capacity to develop these powers and policies to. 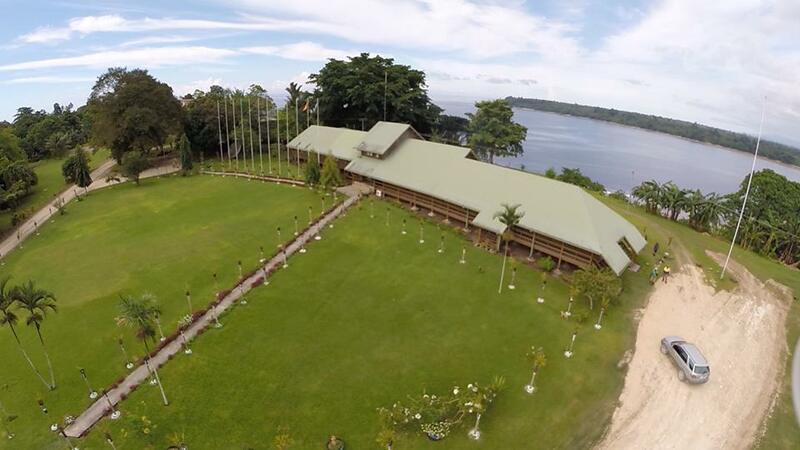 But Momis is also very optimistic that Bougainville will thrive as the autonomous region moves into the future. “Unity is the essence of our success and these problems are not impossible to overcome; our unity does not mean uniformity, it must be an all-inclusive engagement of all Bougainvilleans who must have a say on our political future come the referendum,” Momis said. Momis added that Bougainville determining its future must also include a future for development. Momis also cautioned that people must be realistic of their expectations of the outcome of the referendum. “Everything depends on how hard we work to achieve a favourable outcome of the referendum; we cannot dream of the impossible while we remain complacent and not work hard for it,” he said. “We must have faith and own the process of the referendum so that we can legitimately own the outcome that is credible and excepted by all Bougainvilleans and respected by the international community,” he said. “I must remind you all that in today’s globalized community we must refrain from alienating ourselves international community such as the United Nations who will play an important role at the time of the referendum,” he said. Momis further made a call to all Bougainvilleans not to deviate from the principles of the Bougainville Peace Agreement and to follow it as the guideline to achieving its ultimate political future. Chief Secretary to the ABG Joseph Nobetau has welcomed ABG President Grand Chief Dr John Momis following a period of leave, announcing that he is energized and ready to continue on the path to reform in the ABG. Mr Nobetau said that the President’s return is important as it provides continued stability and leadership for Bougainville. In consulting with the President Nobetau said that he made it clear that he was disappointed with some aspects of recent progress and that he wants to see all members of the executive rise to the challenge of progressing reform to ensure that Bougainville continues on the path to autonomy ahead of the upcoming referendum. “It is clear that the President maintains very strong views regarding the need for enhancing governance and discipline across the public service. As Chief Secretary, I stand ready to work with my colleagues to heal any division that may have occurred during his absence so that we can deliver on the President’s very clear expectations”, Mr Nobetau said. President Momis has been a constant and unifying figure throughout Bougainville’s history and has played a critical leadership role in progressing the Bougainville Peace Agreement and leading Bougainville on the path to autonomy. “As Chief Secretary I am committed to delivering on the Presidents vision for reform. Now, more than ever before, it is essential that we consolidate our status as an autonomous territory as we approach the proposed referendum date”, Mr Nobetau said. Mr Nobetau indicated that over the coming weeks he would be providing further updates on this important work and encouraged the public service to unite to address the many challenges ahead. The Autonomous Region of Bougainville today (Tuesday 14 February 2017) plays host to New Zealand Minister for Foreign Affairs Murray McCully as he embarks on his tour of the region. The objective of the visit is for the Minister to engage in high level discussions with members of the ABG regarding continued bilateral cooperation, impact of existing development projects, capacity for future development projects and cooperation; and possible support for the upcoming referendum. The visit will also provide an opportunity to explore broader political, diplomatic and government to government areas of cooperation. Bougainville and New Zealand have a long history of shared cooperation and support as New Zealand was instrumental in the development of the Bougainville Peace Agreement and since that time has maintained active support through a range of diplomatic and development initiatives. Chief Secretary to the ABG Joseph Nobetau said the symbolic importance of this visit cannot be understated because New Zealand is a friend of Bougainville and has demonstrated a long term willingness to support the ABG as it continues on a path to autonomy, peace and reconciliation. “Through ongoing policing support and other initiatives New Zealand is contributing to the peace and stability of Bougainville,” Nobetau said. “The Minister’s visit is therefore a recognition, at the highest levels of Government, of New Zealand’s commitment to our long term success and growth,” Nobetau said. Nobetau further said that the Foreign Minister’s visit provides a good opportunity to engage on a range of issues of mutual interest. He said this opportunity will also allow the Acting ABG President Raymond Masono to formally convey to the New Zealand Government the appreciation of the people of Bougainville and the ABG for their continued support. Since the signing of Cease Fire in 1997 the New Zealand Government has been providing development support to Bougainville which primarily aims to increase the capacity of the ABG to operate autonomously and in an open, efficient and transparent manner. They have also provided technical support to ABG departments as well as funding important infrastructural developments in health, education and agriculture through their various aid and development programs on Bougainville. Since the inception of the Autonomous Bougainville Government there have been numerous development plans that have not come into fruition. While many of these plans have been well laid out they lacked further development due to incapacitation issues in the Bougainville Administration to carry them out to a successful end. Chief Secretary to the ABG Joseph Nobetau said that he has reviewed many of these plans and has come to the conclusion that though these plans were well-formed they lacked action after their development. Nobetau further stated that it was not enough to develop a plan in and of itself; the public service needed to move past the development and launch phase of the planning process to the implementation phase to prove its worth to the government and the people of Bougainville. Mr Nobetau also revealed that in the coming months a new formal reporting process to the government will be implemented that allows the administration to measure and asses the success of the public service in meeting key corporate and strategic planning goals. As it stands the reporting process will be divided into four key quadrants; Budget and Financial Management, Civil Society, Peace and Law and Order, Social Services (Health, education etc) and Economic Development, Growth and Infrastructure. The aim of the reporting process will be to document activities and actions that seek to address and meet the priorities of the government, it will also act as a monitoring and evaluation mechanism that allows for improvement. “I firmly believe that 2017 will be a year of transformation for the public service and I ask all Bougainville Public Servants to join with me as we embark on this exciting journey to make Bougainville the Black Pearl of the Pacific as she truly is,” Nobetau encouraged. The Autonomous Bougainville Government is currently embarking on measures to improve the efficiency, transparency and accountability of the Bougainville Public Service. Chief Secretary to the ABG Joseph Nobetau said that 2017 would be a period of consolidation and growth where the BPS will position itself to respond to the ever increasing demands of the Government in a way the is efficient and transparent. Mr Nobetau noted the need in 2017 to clearly document both corporate and strategic goals and indicated that the process will operate through two complementary and concurrent processes – Corporate and Strategic Planning. He further emphasised that the corporate planning process must be undertaken at an agency level where each ABG department determines their key priorities for the year ahead. This calls for ABG department to undertake a comprehensive analysis of key strengths and weaknesses along with opportunities and potential threats and allows for all departmental heads to determine how best to move forward with their corporate initiatives that will deliver on the expectations of the ABG. Mr Nobetau has already informed all departmental heads to identify the top four priorities of their departments. “This is the first part of the planning process, once this has occurred I will ask that the departmental heads convene planning workshops to map out a plan for the year ahead,” he said. The Office of the Chief Secretary to the ABG will in turn coordinate the reporting of the progress that will be given to the Government and key stakeholders. Mr Nobetau also revealed that his office will be leading the strategic planning process that will complement the corporate planning work of the government departments. Mr Nobetau further stated that this will extend beyond 2017 and will ensure that there is a long term vision for the ABG public service in the years ahead that allows it to develop and grow the capacity needed to deliver on the expectations of the ABG.